Bariatric surgery is the first step in a lifelong journey toward improved health, increased activity, and enhanced well-being. After the operation, you will need to follow certain nutritional guidelines to help optimize your weight loss, minimize complications, and take in the amount and types of nutrients your body requires. At Griffin Bariatric Hospital, our experienced weight loss surgeons and knowledgeable medical team will customize meal plans and nutritional recommendations to suit your bariatric surgery requirements, anatomic needs, and expressed goals. To help you plan your meals at home and on the go, we have provided a brief overview of some general rules. If you have additional questions about what you should or shouldn’t eat after weight loss surgery please contact us today. Your diet will likely be very different after surgery than before, and you will need to take in plenty of protein—we typically recommend 65-75 grams per day—to preserve your muscle and stay healthy. 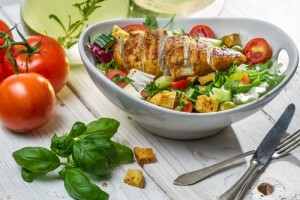 Some examples of high-protein foods include eggs, fish and seafood, meats, poultry, and dairy products (milk, cottage cheese, yogurt), as well as soy milk and tofu. You will also be instructed to take certain vitamins and supplements to help meet your dietary needs, such as a multivitamin, calcium, Vitamin D, and Vitamin B12. You may also require iron and folic acid. Your surgeon will provide a list of required supplements during your consultation and adjust these nutrients as needed throughout your weight loss journey. We want you to feel comfortable, confident, and in control on your path to improved health, and we are ready to provide additional support and information when you need it. If you have questions about your diet, please let us know and we will be happy to provide assistance. Choosing bariatric surgery is a life changing decision, and we’re here to help you achieve your weight loss goals every step of the way. For more information about post bariatric surgery nutrition guidelines and what to expect following a weight loss operation please contact our office today.